Meeting our customers is an important part of the service that we provide in order to find the right boat for you. If you’d like to visit see below for details and location of our warehouse, and where you can find us as we travel the country attending the UK’s boating, camping and leisure shows. 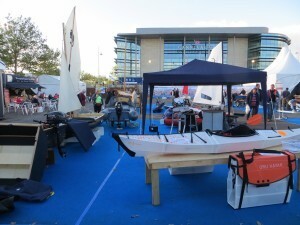 We attend most of the major UK Boat Shows, particularly London ExCeL in January and Southampton in September, plus a few of the smaller ones. Keep an eye on our News page and on Facebook for details of upcoming events. At shows we display as much as possible but (with over 40 boats in the range) can’t bring everything, and different products suit different markets. We have to be selective and sometimes don’t even bring our own brand, Nestaway! Please contact us beforehand if you’re interested in seeing a specific product – don’t make a special journey without checking. Many customers buy from us at shows, often with show-only special pricing, and with some of our smaller boats and kayaks you could even walk away with a boat under your arm! Our boats can be seen at any other time by arrangement at our facilities in Christchurch (Hampshire Dorset border, just over 1hr from M25/M3 junction). Please note that we don’t always have all varieties /sizes of boat available – so please CONTACT US before coming to the warehouse. Besides not always having all products in stock, there are times of year (eg during shows) we may not be there. Send us a message now using the form to the right. The address to our warehouse and sort-of showroom – don’t expect it to be like Debenhams! If you have a SatNav it probably won’t recognise BH23 4FN, as this is a brand new postcode for a brand new industrial estate. ALTERNATIVE POSTCODE. Use instead Grange Road BH23 4JE. Avro Business Park (and Mosquito Way) are directly off Grange Road. DON’T RELY ON GOOGLE MAPS ETC. They are not yet updated and will probably take you to our old warehouse in New Milton.